Chena’s is closed for the 2018 season. We will open Mid May of 2019. Located on the gentle banks of the Chena River, Chena’s Alaskan Grill at the River’s Edge Resort proudly features the combined culinary passions and expertise of our Executive Chef Jameson Kapec and his restaurant staff to create one of the finest restaurant experiences in the last frontier state. Chena’s brings to you modern Alaskan cuisine with a celebration of flavors from around the world. The evolving menu, derived from traditional Alaskan fare, is blended together with contemporary culinary imagination and presented artistically to highlight the excellent quality of the food. Chena’s remains dedicated to using only the best ingredients available, working with local farmers to ensure quality and freshness. Chena’s maintains both refined indoor and relaxed outdoor riverside seating in which attentive waitstaff strive to welcome you and cater to your needs. Chena’s cellar also features a variety of handpicked wines from vineyards located around the world. Each wine has been painstakingly sampled and paired to complement individual items on the menu to further enhance your ultimate dining experience. Conveniently located at the centerpiece of River’s Edge Resort is the classically designed Lodge. In addition to the lobby, a gift shop and second floor lodge suites, is the Miner’s Hall Breakfast Room. 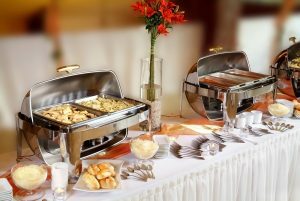 Featuring a full American Style buffet; service starts early at 6:00 a.m. each morning. Indulge in our American Breakfast Buffet with hot and cold cereals, and a rotation of items to include scrambled eggs, pancakes, French Toast, bacon, sausage, breakfast potatoes, assorted breads and pastries. If you want a hearty breakfast before exploring Fairbanks, embarking on a full day Alaskan Tour experience, or meeting business appointments, there is no need to look beyond the Miner’s Hall Breakfast room. My friend Eric, a former Alaskan industrial fisherman, has always told me you haven’t had salmon until you’ve had it fresh from the river in Alaska. Chena’s proves that point beyond amazingly! I don’t eat seafood very often. Just not a big fan… but if I lived in Fairbanks I’d probably eat it almost everyday at Chena’s. It was outstanding. I can’t believe I’m about to type this but: Chena’s salmon was even better than a filet mignon! This is a hidden gem! We had just one night in Fairbanks on Sunday evening and the choices were limited. We found this goldmine and I can say it was awesome. Pulling up to a trailer park, we were a little nervous, but once we stepped inside we were not disappointed. The staff were super friendly, the service was great and the food was excellent. Everything we ordered was superb: Wild Caught Cedar Salmon, Lavender-Honey Infused Halibut, Chicken Kiev. We skipped appetizers since our waiter said dessert was really good. He was wrong: it was AMAZING. Save room for dessert. We had the Apple Crisp, Cinnamon Bread Pudding and the Carmel Coffee Cake (“ABC”). OMGoodness they were the best desserts we’ve had in a long, long time. Highly recommend! The views were spectacular along the river as well. Sunday night had Darrell on the guitar playing and singing songs by request. A great experience overall and the best food we had in Alaska. 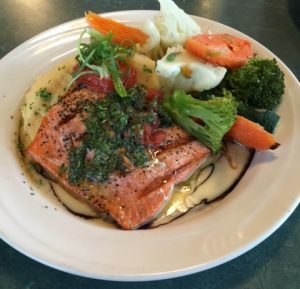 We decided to end our Alaska vacation with a bang and eat at Chena’s, and we were not disappointed! It’s right along the Chena River, has a huge deck for outdoor eating, but also spacious indoor seating for those hot days. It’s both upscale and casual: nice cloth napkins & set ups, yet they have plastic tables & chairs on the deck; the wait staff dresses very professionally, yet there is no dress code for the customers. My favorite part about this restaurant was that they had wine pairing suggestions for almost all of the entrees. Our waitress Cassondra was fantastic as well. She was very personable & knowledgeable. We started with a cup of the Alaskan chowder, ordered the two specialty items for the day for our main dishes, the chimichurri sockeye salmon and the sweet & sour halibut, paired it with the Kung Fu Girl Reisling at the suggestion of our waitress Cassondra, and finished off with the wild berry ice cream & shortcake. They do start you off with half a loaf of sliced bread and olive oil. Their version of Alaskan chowder wasn’t bad, but it wasn’t my favorite that I’ve had. Both the halibut & the salmon were phenomenal. Neither one of us had had our entrees prepared in those styles before and the chef/cooks did immaculate jobs at making sure the flavors in the entrees was well-balanced. These entrees didn’t have wine pairing suggestions (since they were specials), but Cassondra’s suggestion of the Kung Fu Girl Reisling was on point. I was too full to eat an entire dessert by myself, but the few bites of the wild berry ice cream & shortcake were delicious. Great location on the river. We came here early for dinner as we were leaving @3am the next day. We sat outside overlooking the river on the deck with shade. Service was very good unlike some of the other things I’ve read it was attentive and friendly. Food was deliverd ontime and cooked properly. We had a pasta dish and salmon. Both were excellent. I would easily come back here for dinner if I was ever in Fairbanks again. Maybe for Northern Lights. I came to Fairbanks as the last stop on my family vacation with Princess Cruises and ate dinner at Chena’s both nights we were in town. The first evening I had the blueberry cod which was fresh, cooked to perfection, and had a wonderful sauce. For dessert we had the fresh berry cream cake made with mascarpone and accompanied by a huckleberry ice cream which was the highlight of the dish. The second evening I had the pan seared halibut which was even better and in my opinion, fresher than the cod I had the prior evening. The vegetables and basmati rice made for a perfectly portioned meal. Overall, Chena’s is a true gem in the lovely little ‘city’ of Fairbanks. Not only is this restaurant in a beautiful location and really knows how to take advantage of that, but their food is also delicious! I love the wrap around deck, right on the Chen River. They have deck area that is covered for those who appreciate being outside, but want to avoid the sun-in-your-eyes thing, and some uncovered for the all out sun-lovers. I like it all.